Lean manufacturing cannot happen in a factory that lacks dependable, effective equipment. Breakdowns and processing defects translate into excess work-in-process and finished inventory, kept on hand "just in case." Recurring minor stoppages force employees to watch automated equipment that should run by itself. TPM gives a framework for addressing such problems, but many companies implement TPM at a superficial level, and the resulting productivity gains fall short of their potential. If your TPM implementation has resulted in posters and logos rather than a rise of productivity, how are you addressing this halt of progress? 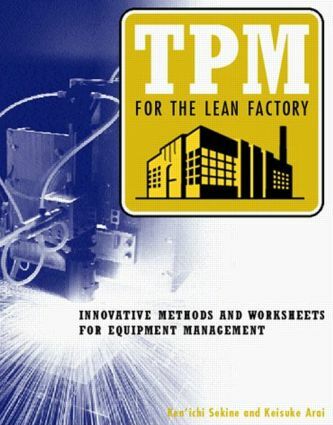 In TPM for the Lean Factory, authors Sekine and Arai teach you to identify and attack the key equipment-related problems and misunderstandings that make plants miss their lean manufacturing goals. Chapters on cell design, product and process quality factor testing, and daily equipment inspection give you additional weapons for fighting waste and low productivity. For practical application, an implementation overview summarizes the steps for each topic, keyed to a set of 50 adaptable worksheets and examples. A practical and supportive resource, TPM for the Lean Factory extends a fresh vision and focus to help you get top results from your TPM efforts.